If you are looking for any one release to start with when it comes to these Book of Angels albums, you might want to start with this one. If nothing else: this is one of my favorite albums from 2008. It's a full band this time around, pulling from a lot of the musicians that graced the first 9 albums (Ribot, Feldman, Cohen, Friendlander) and adds two percussionists in Cyro Baptista and Joey Baron. Amazing set of music. A great mix of some real jazz elements with the klezmer tinge. Watching their videos on Youtube, you can see this is a body of amazing musicians. Just beautiful stuff, great for just putting on and doing your business around the house. The album hits the ground running-- opener "Sother" splits the theme between pizzicato strings and arco ones supporting guitar. But Masada is less about themes and more about being a springboard for improvisation like any great jazz composition and we get there fast-- Feldman takes an extended, powerful, and fierce solo, completely on fire and nudged along by Ribot. And really, these are the keys to what makes this record fantastic-- great playing and great support as a band whose level of interaction is a mix between near psychic response and Zorn's unique exertions over them (everything from switching accompaniment from arco to pizzicato to not at all to conducting triangle strikes and extending brilliant solos). The disc provides some great moments of sound and contrast, recalling old western themes ("Zazel"), high cinematic drama ("Mehalalel") and a playfulness not often found on Zorn records until recently (the sing-song "Azbugah", which evolves quickly into a brush feature for Baron, who creates a gentle, playful and understatedly brilliant performance). Along the way, we get a series of staggering performances on all instruments, although Feldman seems to steal the show pretty much consistently-- from his frantic performances on the opener and closer ("Abdiel") to his Nashville strains on "Rahal". The only real exception being Ribot's blues-drenched feature "Zechriel", where he digs deep and finds some of his more powerful blues exertions with Zorn swirling the band around him. 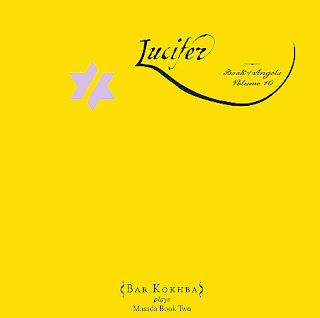 I originally started writing reviews on Amazon because I was frustrated with the glowing fanboy commentary that every album that was released seemed to get, but really, there's been nothing but great things to say about Zorn's most recent output, and "Lucifer" is no exception. Highly recommended. Thank you (both for the opportunity to hear this music ... among my favorite recordings now ... and for your great review). I know, I know. You were too lazy to write a review. But you did anyway! Let's put it this way; I found your info enlightening. Again, a big thanks!